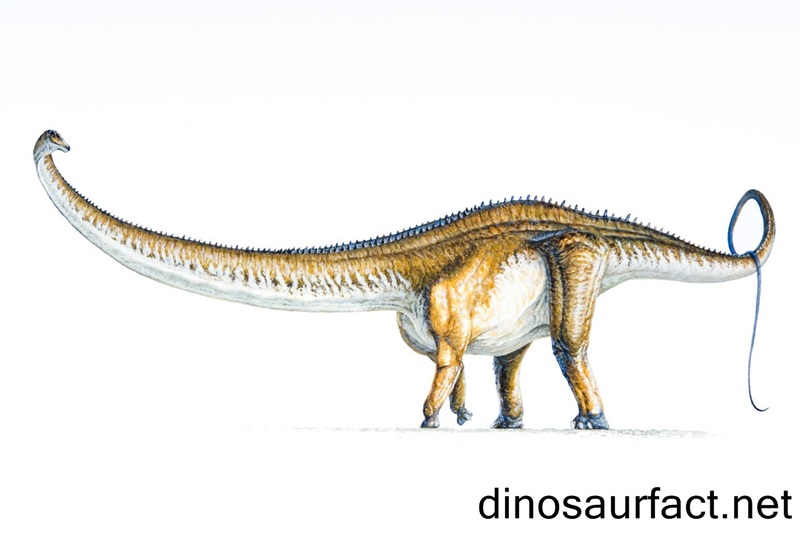 The Barosaurus was a Jurassic dinosaur known for its giraffe like long neck. It roamed the earth around 156 to 148 million years ago. This time span lied between the Kimmeridgian and Tithonian ages of the Jurassic period. Its remains were found in the central region of the United States. The Barosaurus was a gigantic dinosaur. It was a typical Jurassic sauropod. It could grow as long as 27 meters from head to tail. Its adult weight was an astounding 20,000 to 25,000 kilos. Like other sauropods, the Barosaurus was an herbivore. It utilized its long neck to reach for vegetation even at the top of trees. It had heavy legs and a long tail. One of the biggest threats of the Barosaurus was the Jurassic theropods. It relied on its size and strength to defend itself against such predators. The Barosaurus was named for its stature and build. The prefix 'baro' is derived from the Greek word 'baria' which means 'heavy'. The suffix 'saurus' translates to 'lizard' in English. It also has Greek origins. Thus the name Barosaurus was chosen to indicate 'the hefty lizard'. The species name Barosaurus lentus means 'leisurely' in Latin. It was selected to denote the sluggish gait of the Barosaurus. The christening of the remains was done was Othniel Charles Marsh. The holotype of the Barosaurus was discovered by Ellerman. This was found in the Morrison Formation in 1889. In 1912, a few spinal bones were discovered in the Carnegie Quarry. These were initially ascribed to the Diplodocus but were grouped under the genus Barosaurus after many decades ago. A few other fossils were uncovered in the years to come in the Carnegie Quarry which were later ascribed to the Barosaurus. In 2007, an unclassified set of remains were found in the storage facility of the Royal Ontario Museum. They were noticed by David Evans, the curator of the museum. These were found to belong to the Barosaurus. This was a very fortunate discovery as the specimen recovered here was the most complete and best preserved one to ever be seen. It was almost 28 meters long, the largest one to be discovered. Some fossils were excavated in Africa which were attributed to the Barosaurus. It was considered to be a sub species of the American dinosaur. But they were later shifted to a new genus Tornieria. The Barosaurus is classified under sub order Sauropodomorpha and family Diplodocidae. There was never any confusion about the location of the Barosaurus in the taxonomic tree. Its bones were very distinctive and hence Marsh did not have any difficulty determining that it was a sauropod. The Barosaurus is considered a close relative of the Diplodocus. But there exist distinct phenotypic differences between the two dinosaurs and hence they were never presumed to be synonymous. The first bones discovered of the Barosaurus were cervical vertebrae. These were very diagnostically relevant. Although all vertebral segments have not been discovered yet, extrapolations can be made based on the structure of the existing vertebrae. The thoracic vertebrae of the Barosaurus were reduced in number as compared to the other diplodocid dinosaurs. The cervical vertebrae were increased in number. Furthermore, the height of the cervical vertebrae was much larger as compared to other dinosaurs of its family. This facilitated the long neck of the Barosaurus. The Barosaurus possessed over forty coccygeal vertebrae. The forelimb bones of the Barosaurus were a little shorter than its hind leg bones. The bones of the extremities of the Diplodocus and the Barosaurus were similar. The Morrison Formation is a natural geological structure situated in the central region of America. It encompasses most of the central states, including Colorado and Wyoming. The fossils of the Barosaurus were found in South Dakota. The Morrison Formation is composed of different rocks, such a mudstone, sandstone, alluvium and limestone. The color of the structure is predominantly white and grey. The environment within the Morrison Formation varies between marshy areas and arid planes depending on the state being observed. The fossils found in this structure Jurassic period. Many Jurassic dinosaurs such as the Camarasaurus, Apatosaurus, Supersaurus, etc were discovered there. The Barosaurus was a huge dinosaur. It weighed about 20 to 24 tons. Its average length was 82 to 86 feet. It had an unusually long neck. Its head was quite small as compared to the rest of its body. The Barosaurus was not a bulky dinosaur. Other sauropods, although of comparable lengths, were much heavier. Its feet were strong and stout. The tail of the Barosaurus was very long, but not as long those of other diplodocids. The tail became very narrow towards the tip. The Barosaurus was an herbivorous dinosaur. It derived its nutrition by grazing on a variety of vegetation. It was a quadruped; it walked on all four legs. It could support itself on its hind legs for increasing its reach and also assuming an attacking stance. The depiction of the Barosaurus with its forelimbs raised to defend its offspring from a theropod dinosaur is very popular. This can be seen in the American Museum of Natural History. The Barosaurus used its rope like tail to defend itself too. It acted as a weapon to drive predators away. The habitat of the Barosaurus consisted of rivers and lakes which most likely dried up during the summer months. 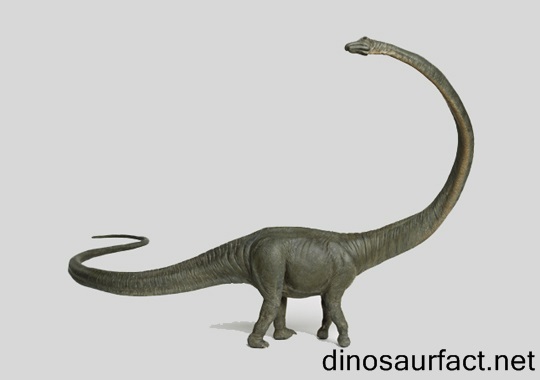 The Barosaurus was related to sauropods such as the Apatosaurus, Supersaurus, Dinheirosaurus, Diplodocus, Tornieria, etc. The Jurassic period was the beginning of the stronghold dinosaurs. Thus, the Barosaurus coexisted with many different kinds of dinosaurs such as the Stegosaurus, Camptosaurus, Ceratosaurus, Allosaurus and the Torvosaurus. It also shared its habitat with many pterosaurs, turtles, salamanders and aquatic invertebrates. The Barosaurus was a classic giant sauropod. It reached an enormous adult size and was one of the largest dinosaurs to ever walk the earth. Its elongated neck was what set it apart from other diplodocids. The other anatomical features of the Barosaurus were comparable with its contemporary dinosaurs. The discovery of the Barosaurus made paleontologists aware of the significance of large sauropods in the ecology of the Jurassic period. Just for fun we have a soundclip available for you to hear what a Barosaurus could've sounded like. Click to the Dinosaur Sounds area to hear it. Please note that the dinosaur sounds are only for entertainment and are not an actual fact.